I have a confession to make. I am a recovered Gel (Shellac) Mani Addict! In 2011, I was introduced to Gel Mani (it was Shellac that I tried) for the first time and after my first try, I was addicted! In that year, I never had my nails bare without Shellac applied. For those of you who don’t know what Gel Mani is, it is a special polish that is applied and then cured under UV lighting with no ‘dry’ time, weeks of wearing with no chipping and no peeling. After countless applications, both my nails and my wallet suffered, so on Jan 1, 2012, my resolution was to cut Shellac out of my life. Proud to say that it was not until a couple of weeks ago that I went back to the salon for a Gel Mani and let me tell you … I felt that strong addiction creeping back again!! With that being said, I was so excited when Red Carpet Manicure sent me a Gel Polish Pro Kit Set, just at the right time. I was a little skeptical of this product and thought… there is no way I can do this myself at home and achieve the same salon results. I was wrong, I was 100% impressed and satisfied with this product! 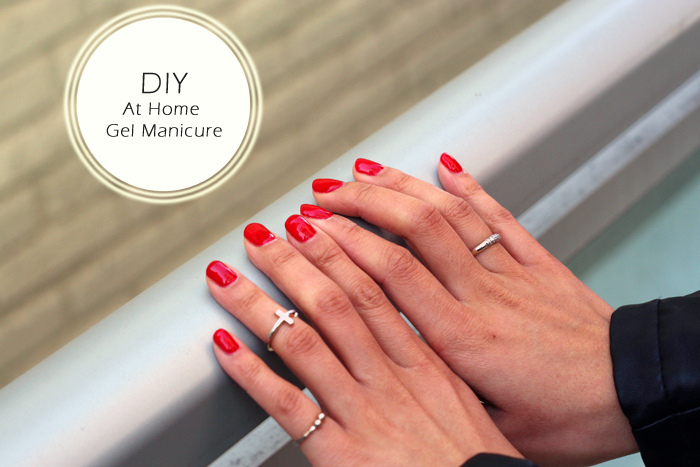 Keep reading for my full review on Red Carpet Manicure and step by step instructions! 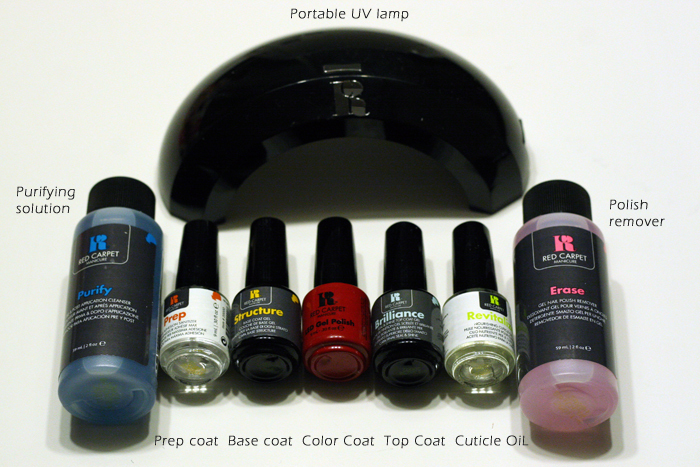 The Red Carpet Gel Polish Pro Kit come equipped with everything you need to start your DIY At Home Gel Manicure journey. 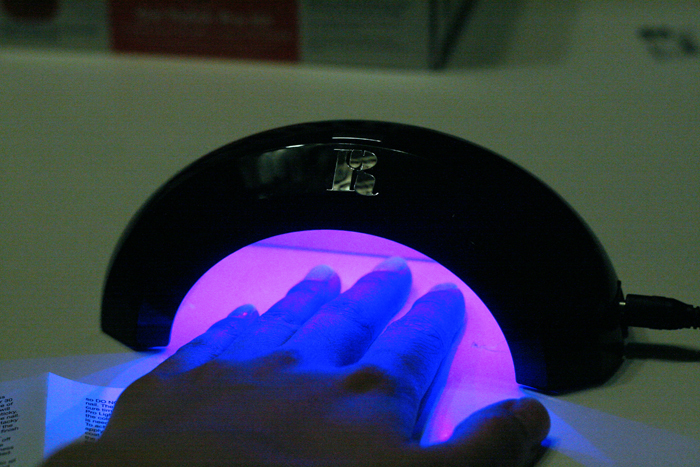 The UV lamp enclosed is portable and only requires a 30-45 second cure time. Which means it only took me less than 15 minutes from start to finish to complete my manicure. Don’t be intimidated by the number of bottles, it is super easy to get started. 7. Wipe nails with Purifying Solution for super shine! To see a full set of How to Videos – click here! Here you have it! I did this on Thursday, and so far NO CHIPS, NO PEELS, NO DULLNESS. I am so happy with the results! I hope you had a wonderful weekend! I had some beach volleyball fun with a group of friends for a birthday party and spent a Friday night watch endless episodes for Diners, Drive-Ins, and Dives! Special thanks to Melissa for introducing me to Red Carpet Manicure and allowing me to DIY my own gel mani at home, saving both time and money! very cool, one day i’ll have to try one of these.. maybe when i spot one on sale!